Give your home a modern-classic feel with this traditional style accent cabinet with an exotic flair. The piece takes traditional elements of cabriole legs and a bombe shape and combines it with an animal print design to accommodate the modern lifestyle. Two drawers with silver hardware rings will work great for storing and organizing belongings. 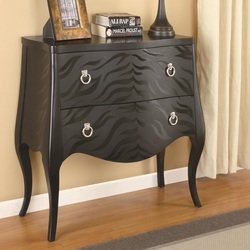 With function and such a fashion-forward design, this accent cabinet is sure to become a popular piece in your home.